Pommel of rock-crystal mounted with two enameled panels which show on one side the Imperial Eagle and on the other, the combined Arms of Bohemia and Hungary. 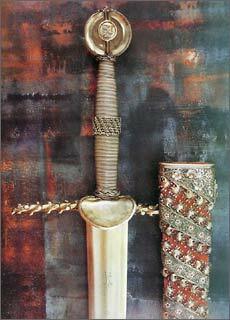 Grip is bound with silver-gilt wire and has a braided reinforcing ring in the center. The silver-gilt iron quillons are formed as branches of flattened section. The blade has two fullers and bears a wolf-mark in brass damascening. The wooden scabbard is covered with red velvet and is decorated with a silver-gilt spiral band which displays flowers and tendrils of foliage in colored enamel. The crystal pommel of this magnificent sword from the Dresden Armoury is decorated with tiny labels bearing the coats of arms of Hungary and Bohemia as well as the Imperial Eagle of Germany, the heraldry of Sigmund I of the House of Luxemburg (1368-1437). He was King of Hungary from 1387, becoming King of Bohemia in 1419; King of Germany in 1410, and Emperor in 1433. Ah1 this gives credence to the story that Sigmund presented the sword to Duke Frederick I of Saxony when he officially invested him with the Electorate of Saxony at Ofen in 1425. Not only the heraldry and the historic circumstances point to Sigmund I as the original owner but also the extremely rich and choice goldsmith's work. The parrying guard in imitation of twisted gnarled boughs conforms to the late gothic style of Central Europe that transformed abstract shapes into plants. One talks of a German "Bough Gothic" style. 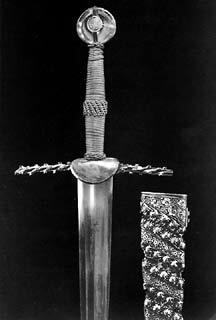 The scabbard is covered with crimson velvet around which a band of gilded silver with laterally attached gothic foliage is wound in a spiral in imitation of the hangings that are always slung around the scabbards of ceremonial swords. On the bands themselves, framed by silver-gilt wires, there is delicate enameling in the Hungarian colors of red, white and green. Filigree enamel was first seen in Venetian Italy during the 14th century. Hungarian goldsmiths adopted it and brought it to perfection. 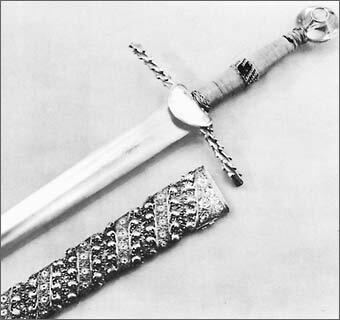 Presumably, therefore, it was a goldsmith at Sigmuiid's Hungarian court who created this splendid sword after 1419, but before the ceremony in 1425. It is the richest example to be preserved of any medieval reign.